Okay, it’s time to get all planned and organized and signed up for the 2016 1st Quarter Finish-Along, so let’s do it. Here, in no particular order, are the projects I want to get done in the next three months. The famous wool cycling jacket, now that the uber-fabulous silk map lining fabric has arrived. I should probably do this soon, so there’s still time to wear it this winter. 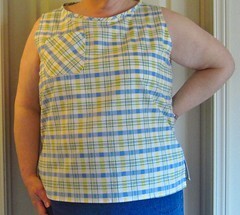 Shell is done; lining, pocket bags, elastic in the sleeves and hem and the back pocket need to be done. 2. 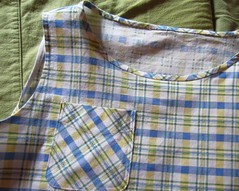 The flannel quilt, a leftover from last quarter’s FAL. Sandwiched and pinned, just needs to be quilted and bound. I plan to make the binding from a plain white sheet. 3. Another leftover, the shark pencil/glasses/whatever case. Just needs finishing and a fix of the zip. 4. The black jumper that I’ve been planning for about forever. Needs to finally happen. 5. Purple jersey top. Can you believe it–a pattern that isn’t 10 years old! 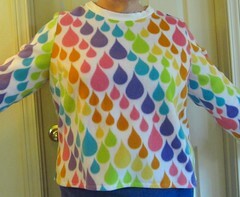 I got the jersey at SCRAP (some outrageous amount, 7 yards or something) and can’t wait to get this done. I’m planning to make the gray version on the right. 6. Cross-stitch clock. Oh man, I don’t even want to think about how long I’ve had this UFO. I pull it out every 5 or 10 years and work on it a little bit more, but somehow it never gets finished. It’s actually pretty close to done now–it just needs to be assembled and put in the wooden case. 8. Boxes for my sewing desk. I need some way to organize the drawers in my desk, and I haven’t found a tutorial for what I want, so today I drew up a pattern for small fabric boxes custom made to fit the space. They’ll be made from these Mary Engelbreit sewing-themed fabrics and I’m going to use interfacing and plastic canvas to stiffen them. 9. Turquoise shirt for my honey. This is his current favorite color, so we picked up this lovely fabric from Cool Cottons in Portland, and he asked for a henley. 10. Dress for me! This Kaffe Fassett print also came from Cool Cottons; the plan is to make the long dress on the right, but with the pockets from the pattern on the left. I also have black piping for the bodice edges. 11. Finish the RSC 2015 quilt. This is a pretty ambitious goal, but I’d like to at least continue work on the blocks so that maybe I can get it done next quarter. I think I’m about halfway done on the star blocks, so there’s plenty more to do. First priority here is probably to work on the little boxes, since I’m reorganizing my sewing room right now. Then it’s on to the jacket. ETA: I have linked this post up to Scraptastic Tuesday and WIP Wednesday. Sunday Sevens is a weekly series of posts containing seven-ish pictures from our week. Thank you to Natalie of Threads and Bobbins for getting it all started. This week was sort of all about new fabric, which is weird considering how rarely I buy fabric, but it was a BARGAIN, so it totally doesn’t count. On Monday, I put the cage around our tomato plants as they’re getting big enough to need one (will also keep out the neighbor kitty that’s been digging in there–BAD KITTY). My mother and sister brought me back fat quarters from Oregon! Hey, don’t judge–all this cost me less than $10! And then there were these on Thursday–$1.50 for the lot! I’m pondering what to do with them, but I keep coming up with some sort of folded-fabric, 3-D quilt. Would have to be a wall quilt, because this is all wool and silk and will have to be dry-cleaned. Hmmm . . . .
By Friday, I was going a little batty due to sewing withdrawal, so I sewed up the first two blocks for my Cozy Afternoon Quilt. And Saturday, I did the second purple block for my scrap quilt. Have a great week, everybody, and I hope you’re able to get some crafty time in there. Sunday Sevens is the brainchild of Natalie over at Threads and Bobbins. It’s a weekly blog series in which we post seven-or-so pictures from our week, usually on Sunday, except if you’re me and it’s been one of those I’M RUNNING AS FAST AS I CAN kind of weeks. Not much crafting this week, as I was house-sitting for my mother and sister while they took a trip to Oregon. They’re both big-time gardeners and temps were still 100F and above, so there was much running around with watering cans and hoses. Isn’t he a cutie? And much less noisy than her other dog, who barked and growled at me THE ENTIRE TIME I was at her house. He would finally stop when I left and closed the door behind me, then START UP AGAIN when he heard me put the key in the door to lock it. Perhaps not the sharpest tool in the drawer. You can’t really tell from this picture, but my basil plants are about a foot tall. That’s a pot of oregano next to it (which is not as happy about the whole heat thing). I did get one more block done on my scrap quilt; the center block here is called Carrie Nation. Mid-morning Friday my partner and I headed out for our camping trip in Montana. Here’s our tent all set up in Quartz Flat Campground, near the town of Superior. We actually arrived in the middle of a thunderstorm and had to wait in the car for it to pass before we could set up. The forecast for Saturday was for temps in the 70s and 50% chance of rain. Instead of that, it was chilly and rained all day; the planned whitewater rafting was shelved in favor of a trip to Missoula for breakfast. Then our group of 11 split up and spent the day shopping and exploring. After checking out the local bike shops, my honey and I did a little hiking around the campground. And I took many, many pictures of moss and lichens. On Sunday morning, it was still raining off and on and we were happy to head home out of the damp. It was a fun trip, though, and the group we were with was full of interesting, quirky characters–just the kind of folks you want to sit around the campfire with. Have a wonderful week, everybody, and I hope you have some good friends to spend it with. Sunday Sevens is a blog series in which we share seven-ish pictures from our week. Thank you, Natalie at Threads and Bobbins for getting it started! Busy week here, but I made some progress on my projects, so it was a good one. I finally got around to finishing up sorting out my scrap fabric drawers. The bins with my main stash are still pretty messy, but at least I’ve got the scraps tidied up so that I can work on some stash-busting projects. By Wednesday, I hadn’t done any crafting in several days and I was getting a little desperate for a fix. So I put everything else aside and made the second block on my Rainbow Scrap Challenge quilt. That Card Trick block in the center was a bit of a brain teaser, but this tutorial was really helpful. Strange things sometimes come in the mail when you live with a bike geek. Saturday craft projects: quilting and wheel building. That fabric there became this, the third block of the RSC quilt. Well, sort of. I tried to make the center block (Marley) twice and just could NOT get it to work with the rather minimal instructions given. Couldn’t find a good tutorial, either, so I did this one instead. I’m subbing another block for the fourth one, too. And it is officially too damn hot here. The official high here on Saturday was 111F, which I’m fairly certain is the same temp as the surface of the sun. And we’ve got at least a week of over-100 days coming up.